Lego sets have provided a wealth of information for the otherwise very secretive Marvel adventure Avengers: Endgame. The culmination of 10 years in superhero filmmaking, this epic will be one of the biggest blockbusters of the year. And we've barley seen anything on an official capacity. Two trailers have arrived, giving us exactly two and a half minutes from a three hour endeavor. Today, we get a look at authentic LEGO sets, which open this world just a little wider, offering a peek at what we can expect. The first set in question is called Iron Man Hall of Armor, and gives us a peek at all the suits Tony Stark will be strapping on for the final time in the MCU. There is no official conformation that we'll see all of these suits in action. But we also get a look at Dum-E. The second set is the Avengers Compound, which teases one of the movie's big action set pieces. It shows Hulk fighting Thanos on Earth, with some of the vehicles that will be present. The third set is for Captain America Outrider Attack, which shows Steve on an oversized motorcycle, also teasing what could be the same action scene, as these sets usually interlock. Other leaked details from weeks ago hint that there will be a new Lego set for the Avengers Super Quinjet. The Avengers Compound comes with mini-figs for Iron Man, Hulk, Captain Marvel, and Nebula. Nebula is the only one who appears to be in her Quantum Realm suit. The fact that Nebula, Iron Man and Captain Marvel are together in this set hints that perhaps Carol Danvers has saved these two from dying, stranded in space. There is also a very tiny Ant-Man included here that you can't really see on the packaging. 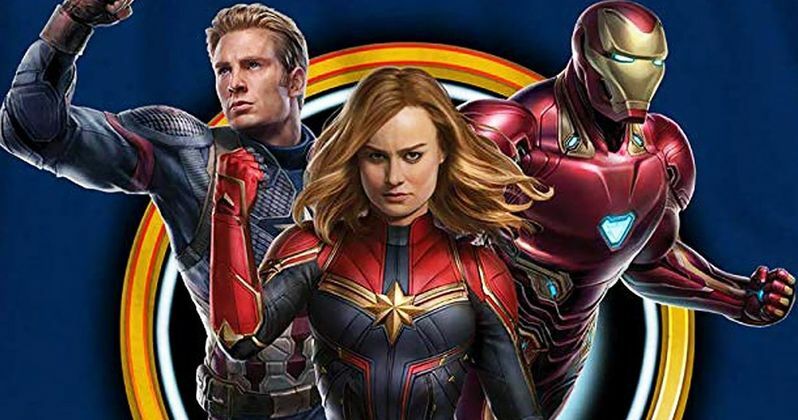 Related: Will Avengers: Endgame Decimate All Opening Box Office Records This Weekend? The Hulk mini-fig toy is smiling, further hinting at his transformation as first seen in Thor: Ragnarok. Looking closely at Thanos, you'll see that he's not only wearing the Infinity Gauntlet, but he also wields a big cosmic hammer. All of these playsets include Outriders. It is speculated that Thanos and the Outriders will attack the Avengers compound at some point in the movie. That may be why Tony Stark activates all of these old Iron Man suits. There is also the theory that the Avengers will face off against Thanos on Earth in the past, through time travel. Though, looking at these sets, we have to keep in mind that the Russo Brothers said some toy sets don't exactly represent what is in the movie. And that's something we've certainly seen with past movies and their ensuing merchandise.